S. Korea pressured to disclose details of intervening in forex market. April. 16, 2018 07:40. by Hye-Ryung Choi herstory@donga.com. The United States has demanded that South Korea reveal details of its interventions in the foreign exchange market because Washington believes that Seoul has influenced exchange rates to boost the price competitiveness of its exporters. If Seoul, pressured by Washington, chooses to disclose its statistics about the foreign exchange market in detail, speculators may move in a direction to reval‎ue the Korean won. The South Korean government has faced a dilemma where it should meet the demands of the United States to swiftly reveal details of its interventions in the foreign exchange market in a timely manner while also coming up with a way to protect the efficiency of its foreign exchange policies. According to the Ministry of Strategy and Finance Sunday, the extent of details to be disclosed is expected to be determined by how often and when to disclose the information and whether the amount of net purchases will be disclosed. The government is basically planning to make the period of disclosure longest possible, from around three to six months. The United States has made public details of its interventions in the market on a quarterly basis. “We are thoroughly checking whether the recent cases of other countries can be applied to South Korea,” said a Finance Ministry official, hinting at a possibility that the government will refer to the cases of Singapore, Malaysia and Vietnam that lately decided to reveal their intervention histories for the first time. The three countries announced that they would disclose details on a half-yearly basis with a delay of six months. Accordingly, the histories of intervention made in the first half will be disclosed in the latter half. 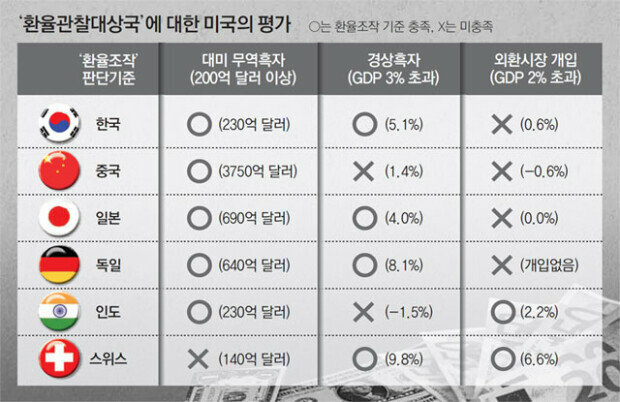 The Korean government also believes that it is desirable to take an approach of disclosing only net purchases so as to reduce the exposure of the country’s strategy as revealing all purchases and sales will likely make it easier for speculators to identify the government’s patterns of interfering in the market. Singapore and the other two countries also decided to disclose net purchases. Still, it remains to be seen whether Washington will accept Seoul’s stance on this matter. The United States has claimed that South Korea deval‎ues its currency for exporters’ price competitiveness and has demanded for detailed histories of intervening in the foreign exchange market. If the Korean government’s decision falls short of its expectations, the United States is likely to pressure the country through its exchange rate report. Going through the 1997 Asian financial crisis, South Korea adopted a current floating exchange rate system as the government was no longer able to manage the value of its currency with the country’s foreign exchange reserves drained. Yet, considering the country’s high dependency on exports, financial authorities have engaged in “smoothing operations” against extreme one-sided movements of exchange rates. Details have been kept in secret by the government to protect the stability of the currency’s value from the possible attacks of speculators. The United States and the International Monetary Fund (IMF), while acknowledging the Korean government’s interference in the market for the sake of the rate’s stability, have steadily recommended that South Korea disclose histories to enhance transparency.